Bring Me The Horizon are just one of those bands that are going to be wildly despised; commonly derided for their limelight addicted, pretty boy frontman, and their chart-chasing metalcore-pop. There’s nothing they can do about it. They are destined to be bottled at festivals and booed during support slots (just note their incredibly hostile reception supporting Machine Head in 2011). This is their fate, like My Chemical Romance before them. This is also despite their real, ambitious talent. Regardless of whatever it is the ‘true’ metal community (whoever them may be) finds at fault with the Yorkshire five-piece, their technical ability and lyrical prowess is undeniable. As 2010’s ‘There Is A Hell…’ and this year’s ‘Sempiternal’ – which charted in the UK at a commendable No.3 – proved, Bring Me The Horizon (BMTH) are methodically taking the tired subgenre of metalcore skyward, both in terms of mainstream accessibility and serious musical progression. 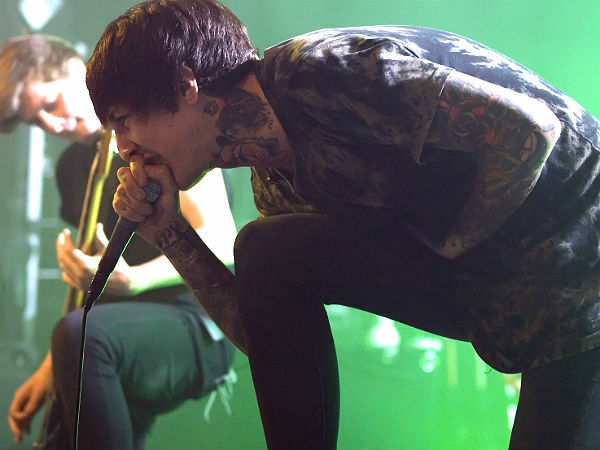 However, the fact of the matter remains that singer Oli Sykes is a good lookin’ poser in need of having his motor-mouth stuffed with a sock, and the screaming crowd of teenage girls isn’t going to help matters of credibility. But who needs metal credentials when you have fans as dedicated as Sykes’? The crowd of tonight’s intimate KOKO show, in support of their new release, is nothing short of dumbfounding. The roaring cheers, the movement, the ear-piercing singing, the SWEAT; BMTH have the adoring crowd unequivocally won over from the moment they open with ‘Shadow Moses’. It helps, of course, that Sykes causes pandemonium each time he even glances at the crowd, and can summon a formidable circle pit with just a single suggestive hand motion. It’s crucial, though, to look past all this, because at the root of this hubbub is a genuinely exhilarating performance, with near-perfect sound, and a short but sharp setlist of songs. Older cuts like ‘Chelsea Smile’ and ‘Diamonds Aren’t Forever’ (from 2008’s ‘Suicide Silence) deliver bruising breakdowns and thrashy shredding, with the latter prompting a ‘wall of death’ mosh pit, while fan favourite ‘It Never Ends’ confirms their knack for crafting a tuneful chorus. Tonight’s setlist is, unsurprisingly, predominantly dedicated to newer material, and this is where BMTH truly excel. Now backed by a electronics programmer and keyboard player – Jordan Fish – songs like ‘Go To Hell, For Heaven’s Sake’, ‘Empire (Let Them Sing)’ and closer ‘Sleepwalking’ showcase the pained melodic metal style BMTH have discovered, underpinned by doom-laden keys and intelligent guitar-work. The only thing missing tonight is an outing of ‘Crucify Me’ from ‘There Is A Hell…’ – surely their greatest ever composition. The highlight is ‘Blessed With A Curse’, from their 2010 album, which is something of a haunting metal ballad, complete with bluesy guitar parts and a passionate vocal performance. The band’s fans scream back every word, loud and proud. “This is an excellent crowd”, mumbles Sykes, an understatement if there ever was one. ~ by cliveparisrozario on May 19, 2013. Reblogged this on Take a look into my head..